Claiborne Fox Jackson was Missouri's 15th Governor and was a leader of the pro-slavery supporters that tried to get Missouri to secede from the Union and join the Confederate States of America. He was the only civilian to lead forces into battle during the American Civil War. Born in Fleming County, Kentucky to a large family. Jackson's father owned a modest farm and three slaves when Claiborne Fox Jackson was born. Between 1823 and 1826 many of Jackson's brothers had migrated into Missouri. In June of 1826, Claiborne Jackson left the family farm in Kentucky and followed his brothers to Missouri. He traveled by steamer down the Ohio River and up the Mississippi River to St. Louis, Missouri. From there another steamboat up the Missouri River to his destination at Franklin, Missouri just across the river from Boonville. In this area in the Missouri River Valley, known as "Little Dixie," tobacco and hemp were the staple crops. The Missouri Compromise of 1820 had brought Missouri into the Union as a "slave" state and Maine in as a "free" state. Many of the settlers along the Missouri River Valley came from southern states. These settlers brought their slaves with them. Slave owners in Missouri owned, on average, half the number of slaves as in other southern states. Upon his arrival in Franklin, Jackson aspired not to be a farmer like his father, but rather to be a merchant. He soon found work as a clerk for a local Franklin business, Hickman and Lamme. Jackson was an imposing figure, standing more than six feet tall. It was not unheard of for him to resolve disputes with violence. In 1827, he and another clerk from Hickman and Lamme were sued for assault by a competing business. Jackson joined the local militia and rose to the rank of Major in the militia as a result of his actions in fighting against the local Native Americans. In 1828, Jackson stated his own merchant business, C. F. Jackson & Co. This business did not last very long and by 1831, Jackson had moved west into the next county over, Saline County. It was here that he married the daughter the the very influential John Sappington, a planter and physician. Jackson would become quite successful as a business partner with Sappington. John Sappington was a close friend and ally of Missouri US Senator, Thomas Hart Benton. Claiborne Jackson would also align himself with Benton and use that to launch a political career. Jackson received the nomination from the Democratic Party and was elected to the Missouri House of Representatives in 1836 where he became a tireless advocate for conservative politics. Jackson resigned his seat in 1837 to accept a key position as cashier in one of the branches of the newly chartered Missouri State Bank in Fayette, Missouri. During his time there, Jackson would also participate in mercantile ventures and land speculation. The Panic of 1837 followed by victories in the elections of 1840 by the Whig Party would cost Jackson his job at the bank. Jackson returned to working for ventures controlled by his father-in-law, John Sappington. In 1842, Jackson would be nominated and be re-elected from Howard County to the Missouri House of Representatives. Sterling Price would be the Speaker of the House and Jackson was elected as the Majority Leader. Jackson used this position to advantage and became one of the power brokers in Missouri State politics. In 1844, after Sterling Price was elected to represent Missouri in the U.S. House of Representatives, Claiborne Fox Jackson was elected as the Speaker of the Missouri House. While serving in the Missouri House of Representatives and the Missouri Senate, Jackson would continue, unsuccessfully, his pursuit for the higher offices of governor, US Congressman, and US Senator. During this time there would be a falling out with his earlier mentor, US Senator Thomas Hart Benton. Benton had publicly opposed the annexation of Texas and, subsequently, the war with Mexico. This left him at odds with many of his constituents in Missouri. Benton further angered Missourians when he openly supported Martin Van Buren's 1848 run for President as the nominee of the Free Soil Party. Jackson took advantage of this and began to actively work to remove Benton from office. Together with William B. Napton in 1849, Jackson introduced the Jackson-Napton Resolutions in the Missouri House and Senate. These resolutions stated that Congress was not authorized to legislate against slavery in US territories and that those territories should be able to decide for themselves on the issue of slavery (i.e., popular sovereignty). That the Missouri Compromise could be applied to new territories for the sake of harmony and preservation of the Union, but in the event of passage of any act in conflict with the above principles, Missouri would cooperate with slaveholding states in measures necessary for mutual protection against northern fanaticism. These resolutions were quickly passed with large majorities in the Missouri House and Senate. But as Benton returned to Missouri to argue against these resolutions, public opinion began to turn against Jackson and the resolutions. In 1850, the Missouri state legislature voted against returning Benton to the US Senate. But they did not vote for Jackson but rather elected Henry S. Geyer of the Whig Party to fill Benton's seat. Jackson received a lot of criticism for the Democrats losing the Senate seat to the Whig Party. But in 1852, the Jackson-Napton Resolutions came under attack in the Missouri House of Representatives. His opposition in the Missouri House was being led by Representative Frank Blair from St. Louis, Missouri. Blair was leading the charge to repeal the resolutions. As his political fortunes ebbed, Jackson would run for US Congress in 1852 and be defeated by a political newcomer, Whig James J. Lindley. 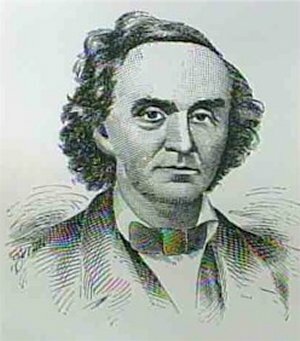 Following Benton's demise, David Rice Atchison from Platte County was now the senior Senator from Missouri and became an ardent supporter of slavery. At the request of Illinois Senator Stephen A. Douglas, Atchison would introduce the Kansas-Nebraska Act of 1854 and work hard for its passage. This act divided the Nebraska Territory into the separate territories of Kansas and Nebraska. It also stated that each territory would use popular sovereignty to establish their state constitutions, essentially repealing the Missouri Compromise of 1820. Many Free Soilers, particularly those in New England, saw this as an opportunity to stop the expansion of slavery into the western territories. The New England Emigrant Aid Society was formed with the express purpose of settling the Kansas Territory with as many free soil advocates as they could recruit. Many Missourians, Jackson included, saw this as an opportunity to spread their way of life west into the Kansas Territory. Led by Senator David Rice Atchison, they too would sent emigrants to Kansas for the purpose of ensuring it would become a state where slaves would be legal. During the Kansas territorial elections held in 1855, thousands from Missouri would cross the border to vote. Claiborne Fox Jackson was one of those who voted in the Kansas elections. As the border violence escalated, Missourians would lose the propaganda war and receive widespread condemnation for their actions in Kansas. They would also lose the elections and in 1859, the Wyandotte Constitution to establish Kansas as a free state was overwhelmingly passed in a territory-wide referendum. On January 29, 1861, Kansas became the 34th U.S. state admitted to the Union. Back in Missouri, Jackson's political star began to rise subsequent to the pro-slavery setbacks in the Kansas Territory. By 1860, Jackson had garnered enough support to embark on a run for governor. He received the Democratic Party's nomination for Governor of the State of Missouri. There was some consternation among his supporters when Jackson came out in support of Democratic Party Presidential candidate Stephen A. Douglas. In the end, Jackson was elected the 15th Governor of Missouri by a small plurality. During the 1860 elections, the voting results in Missouri clearly indicated that Missourians were moderates with respect to slavery and secession. Jackson would be the Governor for less than a month by the time seven states had voted to secede from the Union. "The South are not the aggressors. They only ask to be left alone. ... If South Carolina hasacted hastily, let not her error lead to the more fatal one - an attempt at coercion [by the Federal Government]. ... The first drop of blood shed in a war of aggression upon a sovereign State will arose a spirit which must result in the overthrow of our entire Federal system. ... And Missouri will in my opinion best consult her own interests, and the interests of the whole country, by a timely declaration of here determination to stand by her sister slave-holding States, in whose wrongs she participates, and with whose institutions and people she sympathizes." "... consider the then existing relations between the government of the United States, the people and governments of the different States, and the government and people of the State of Missouri; and to adopt such measures for vindicating the sovereignty of the State and the protection of its institutions, as shall appear to them to be demanded." Jackson would work behind the scenes preparing for Missouri's secession from the Union. He tried to obtain arms for the State Militia from the Federal Arsenal in St. Louis, Missouri. But on February 18th, Missouri overwhelmingly voted to elect Unionists as delegates to the convention. By a vote of 98-1, the convention's delegates would formally declare in a resolution that "no adequate cause exists to impel Missouri to dissolve her connections with the Federal Union." Further, the resolution would recognize that Missouri would maintain a state of armed neutrality. In response to the resolution, Jackson was still hopeful and took his plans for secession underground. Jackson began to lay plans to beef up the state militia. Jackson's opponents were not sitting on their hands, waiting. US Congressman Frank Blair was organizing units of Home Guards in St. Louis. He also was cooperating with Captain Nathaniel Lyon in command at the Federal Arsenal of St. Louis. "Sir, ... your requisition in my judgment, is illegal, unconstitutional and revolutionary in its object, inhuman and diabolical, and cannot be complied with. Not one man will the state of Missouri furnish to carry on such an unholy crusade." Lincoln's call for volunteers followed by Jackson's refusal to comply emboldened many to talk openly about secession. But Blair, working with Lyon, were able to begin mustering volunteers in St. Louis and soon had mustered over 2,500 men. Governor Jackson was working behind the scenes to align Missouri with the Confederacy. He had been in contact with Jefferson Davis and has gained his commitment to send four artillery pieces to the Missouri State Guard in St. Louis. Working with the local commander of the militia, Daniel M Frost, Jackson ordered the Missouri State Guard in St. Louis to assemble for drilling. On May 6th, General Frost established his militiamen at Lindell Grove (the current campus of St. Louis University on Lindell Boulevard) in the western part of St. Louis. There were close to 900 men encamped at what Frost had named "Camp Jackson." Nathaniel Lyon, now a Brigadier General, kept a close eye on what was going on at Camp Jackson. Lyon considered it to be a camp full of traitors to the Union. He began planing to neutralize the militia at Camp Jackson. On May 10th, Lyon moved against the encampment with 6,000 to 7,000 men and surrounded it on three sides a little after 3:00 in the afternoon. Because they had not completely surrounded Camp Jackson, about one third of the militia were able to escape. Lyon sent a message to Frost demanding his surrender. Outnumbered eight or nine to one, Frost had no choice but to surrender. Lyon offered then parole if they would swear an oath of allegiance to the United States. Since only ten men accepted this offer, Lyon marched the rest (669 men), under guard, through the city streets back to the arsenal. There were a great many onlookers watching the procession. The pro-Southern onlookers were hurling insults at the Federal soldiers. Eventually, they began to throw things at the soldiers. Someone in the crowd fired a pistol at the Federals. Additional shots were fired. The German recruits responded by firing into the crowd of onlookers. Eventually, Lyon was able to get his troops under control. Twenty-eight civilians were killed and around 75 were wounded. Two Federal soldiers were killed along with three of the prisoners. The "Camp Jackson Affair" received a lot of publicity and greatly increased the tensions in Missouri. Many Missourians who had been neutral came out in favor of the southern Confederacy. Former Missouri Governor Sterling Price was once of these. He had actively supported Missouri neutrality, but now offered his services to Governor Jackson. On May 12th, Jackson appointed Price as Major General in command of the Missouri State Guard. In order to buy time, Jackson sent Price to meet with Union General William S. Harney, commander of the Federals in St. Louis, and negotiate a "truce." Price and Harney met on May 20th and drafted a formal agreement. It said that Missouri would be responsible for maintaining order in the state and that Harney would not use Federal troops for this purpose as long as order was being maintained. Both Blair and Lyon were incensed by the agreement. On May 30th, Harney was relieved of command. Lyon was placed in command of the Department of the West. "Rather than concede to the State of Missouri the right to demand that my government shall not enlist troops within her limits, or bring troops into the State whenever it pleases, or move troops at its own will into, out of, or through the State; rather than concede to the State of Missouri for one single instant the right to dictate to my government in any matter, however unimportant, I would see you, and you, and you, and you, [pointing to each man in the room] and every man, woman, and child in the State dead and buried. This means war. In an hour one of my officers will call for you and conduct you out of my lines." Lyon walked out of the meeting. Missouri would soon be at war. Price and Jackson quickly left St. Louis for Jefferson City to begin preparing for war. Price convinced Jackson that Jefferson City had to be abandoned because it was not easily defended. They withdrew up the Missouri River to Boonville, Missouri. On June 12th, Governor Jackson issued a proclamation condemning the Federal aggression enacted by Lyon an Blair. It stated that Missouri was no longer obligated to submit to the unconstitutional edicts of the military despots. It called for Missourians to throw off the shackles and secede. Lyon prepared a plan to capture the Missouri State Guard. Lyon would take his main force west along the Missouri River and pursue the Missouri State Guard to Springfield, Missouri. A smaller force under Thomas Sweeny would head for Springfield via Rolla, Missouri to prevent any movement of Confederate forces from Arkansas. Lyon loaded about 2,000 troops onto steamboats and headed for Jefferson City, Missouri. Upon finding that the Price and Jackson were not there, he left a small force to occupy the state capital and continued on to Boonville with about 1,700 men. When Jackson and Price arrived in Boonville, Price realized that their best hope was to prepare for a delaying action against the Federals before withdrawing south and west. The Missouri State Guard was still too green and too poorly armed to be an effective fighting force. However, Price was quite ill and left the Missouri State Guard under the command of Governor Jackson while he went to recuperate at his home in Keytesville, Missouri. Jackson ordered his nephew, Colonel John S. Marmaduke to prepare a defense of Boonville. On June 17, 1861, Lyon's troops disembarked and marched toward Boonville. They encountered pickets as they approached the bluffs, but Lyon deployed skirmishers and pushed his men forward rapidly. On a ridge behind the bluff waited a few hastily formed and ill-equipped companies of the Missouri State Guard, totaling about 500 men with no artillery. Lyon deployed his men and artillery and advanced. The artillery soon displaced Missouri State Guard sharpshooters and the Union infantry closed with the line of guardsmen and fired several volleys into them, causing them to retreat. This portion of the fighting lasted only 20 minutes. Some attempts were made to rally and resist the Federal advance, but these collapsed when a flanking Union company seized the camp behind them, and a siege howitzer on one of Lyon's riverboats began shelling the Missouri State Guard positions. The Missouri State Guard retreat rapidly turned into a rout. The guardsmen fled back through the town of Boonville. Some headed for home, but most joined the Governor in retreating to the southwest corner of the state. The short fight and precipitate retreat gained the nickname "The Boonville Races." Lyon took possession of the town at 11:00 A.M. The Missouri State Guard had escaped, but it was badly dispirited by this early defeat. As the Missouri State Guard withdrew to southwestern Missouri, Price went to Arkansas to seek help from the Confederate forces under Brigadier General Ben McCulloch. This left Jackson in command of the Missouri State Guard. There were about 4,000 armed men and 2,000 unarmed recruits. Former US Senator David Rice Atchison had joined them in Lamar, Missouri. In early July, they had reached Carthage, Missouri and discovered that there was a Federal Brigade commanded by Colonel Franz Sigel across their planned route. On July 5, 1861, Sigel marched his brigade (about 1,200 men) out to meet the Missouri State Guard about 10 miles north of Carthage. Sigel immediately realized that he was outnumbered and in danger of being flanked and cut off. He began a fighting withdrawal, heading back to Carthage. By the end of the day, an exhausted brigade of Federals had escaped and were headed that night to Sarcoxie, Missouri. Their successful escape was due as much to Sigel's well-executed tactics as to the disorganized command of the Missouri State Guard. Although Governor Jackson was in overall command, he delegated operational command to Brigadier General James Spencer Rains. Due to his inexperience, Rains did not maintain operational contact with all the units engaged in the battle and the movements of the Missouri State Guard were not coordinated. The Battle of Carthage was a victory for the Missouri State Guard and boosted the morale of the troops. After the battle, Jackson took the Missouri State Guard south and met up with Major General Sterling Price near Neosho, Missouri. Price assumed command of the Missouri State Guard and Jackson and Atchison headed for Memphis, Tennessee to meet with Major General Leonidas Polk, one of the Confederate commanders in the west. They were able to convince Polk to send Confederate forces into southeastern Missouri. On July 22nd, the executive committee of the Missouri State Convention reconvened and called for the convention to reassemble in Jefferson City. On July 30th the Missouri State Convention declared the existing state offices vacant, removing Jackson from his office of Governor. It then installed Hamilton R. Gamble as the provisional governor of Missouri and appointed the remaining state officers. It also declared all the seats of the legislature vacant and set a date for new elections. There are questions regarding on the point of whether the Convention had the authority to vacate all the seats of government in Missouri. But there is no doubt that Gamble had the power of the US Federal Government supporting him. Jackson moved on from Memphis to Richmond, Virgina to meet with Confederate President Jefferson Davis. He obtained commitment from Davis that the Confederacy would provide support for Missouri once it had voted to secede from the Union. Rejoining Atchison and exiled Lt. Governor Thomas C. Reynolds near New Madrid, Missouri, they decided to issue a "Proclamation of Independence" separating Missouri from the Union. Next, Jackson left New Madrid to rejoin Price and the Missouri State Guard. The Guard had just participated in the defeat of Union Brigadier General Nathaniel Lyon's forces at the Battle of Wilson's Creek (also known a the Battle Oak Hills) on August 10, 1861 and were headed for the Missouri River. Jackson was present on September 20, 1861 when Price and the Missouri State Guard defeated and captured the Federal forces under the command of Colonel James A. Mulligan in the First Battle of Lexington (also known as the Battle of the Hemp Bales). Jackson was thrilled with the victory and had hoped to install his state government in Lexington. But Union Major General John Charles Fremont was headed for Lexington with large force and forced Price to withdraw from Lexington. In the fall, Jackson's government set up a provisional capital in the town of Neosho, Missouri. On October 30th, the legislature passed a bill for Missouri's secession from the Union, citing various "outrages" committed against the state and the overthrow of its government by Lyon. Jackson signed it on October 31st. There is some question whether this legislature had the authority to secede from the Union, for earlier in the year the legislature had given the authority to secede to the Missouri State Convention. There is also a question concerning whether there was a quorum present when the vote was taken. Whether legal or not, Missouri was admitted to the Confederacy by the Confederate Congress on November 28, 1861. After Jefferson Davis appointed Major General Earl Van Dorn to command Confederates forces in the Department of the Trans-Mississippi, Jackson convinced him to combine the forces of Brigadier General Ben McCulloch and Major General Sterling Price. Van Dorn was going to attack the Federals commanded by Brigadier General Samuel R. Curtis. Curtis had recently been able to force Price and the Missouri State Guard to leave Missouri and withdraw into Arkansas. Jackson was there on March 8, 1862 when Curtis' Federal forces defeated the Confederates led by Van Dorn in the Battle of Pea Ridge (also known as the Battle of Elkhorn Tavern). Jackson would spend what little remained of the rest of his life trying to overcome what appeared to be the inattention of Jefferson Davis to the war taking place west of the Mississippi River. In 1862 he died from pneumonia on December 7th and was buried in Little Rock, Arkansas. After the conclusion of the war, he was re-interred in Sappington Cemetery near Arrow Rock, Missouri. Gilmore, Donald L. Civil War on the Missouri-Kansas Border " target="_blank">Civil War on the Missouri-Kansas Border. Gretna: Pelican, 2006. Hinze, David C. and Karen Farnham. " target="_blank">The Battle of Carthage: Border War in Southwest Missouri, July 5, 1861. Gretna: Pelican, 2004. Phillips, Christopher. Damned Yankee: The Life of General Nathaniel Lyon " target="_blank">Damned Yankee : the life of General Nathaniel Lyon. Columbia : University of Missouri Press, 1990. Phillips, Christopher. Missouri's Confederate: Claiborne Fox Jackson and the Creation of Southern Identity in the Border West (Missouri Biography Series) " target="_blank">Missouri's Confederate : Claiborne Fox Jackson and the creation of southern identity in the border West. Columbia : University of Missouri Press, 2000.